DALLAS, Sept. 28, 2018 /PRNewswire/ -- Legacy Exploration's CEO, Andrew Gautreaux, has gladly accepted his invitation to join the newly formed Dallas Mavericks Advisory Council (D-MAC). Organized by Cynt Marshall, D-MAC consists of 27 members, including business leaders, civic leaders, corporate partners, and season ticket holders. 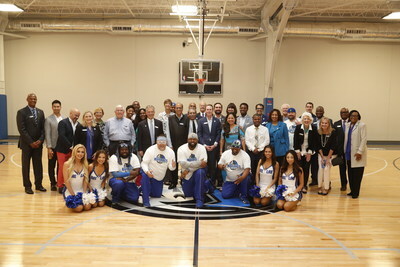 This council creates an effective and powerful voice within the Dallas community, providing feedback, advice, and recommendations to help meet challenges, identify risk and attain business-related goals for the Dallas Mavericks. D-MAC members have the opportunity to advise CEO Cynt Marshall on external relations and strategy within the community. Mark Cuban and Cynt Marshall are committed to excellence and Mr. Gautreaux admires their willingness to address tough issues, seek wise counsel, and execute decisions that push the Mavericks to be a better organization. Andrew Gautreaux said, "What separates a good leader from a great leader is how they manage people and deal with issues. Mark Cuban has been extremely proactive in correcting the systemic problems that were previously inside the organization. I have already noticed a huge transformation both inside, and outside of the organization, and it wouldn't surprise me if the NBA adopted the systems that the Dallas Mavericks have implemented. I applaud the new leadership Mark has put in place and frankly, it was a bold move, but the right move. I am honored to be a member of D-Mac, and because I understand the importance of overcoming challenges, I think I will fit right in." "I am honored to be part of the Dallas Mavericks Advisory Council, and D-Mac has my unwavering support. I hope to see everyone at the 41 home games this season (hopefully more), to cheer on your Dallas Mavericks! Go Mavs!" Legacy Exploration, LLC is a rapidly growing independent oil and gas company based in Dallas, Texas focused on exploration and production through the use of cutting-edge technology.